In relation to OSB, plywood is lighter and easier to work with. It swells less when wet/is stiffer than OSB; therefore, plywood floors are less likely to cause cracked tile or become spongy. It emits less off-gas formaldehyde (a carcinogen). However, it is less uniform than OSB and delaminates in hot climates. 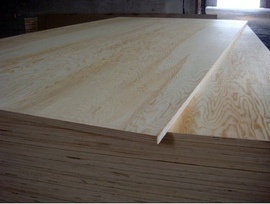 Plywood is generally $3 to $5 more expensive per panel than OSB. This translates into roughly $700 more for a typical 2,400 sq. ft. home. Replacing fir faced plywood siding generally runs around $3.88 per sq. ft.